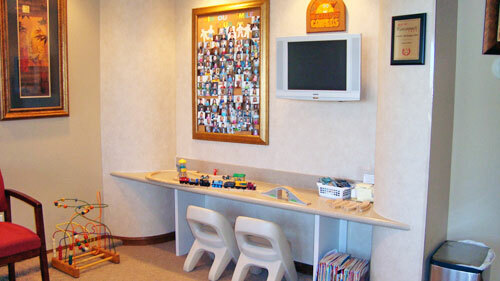 We offer several tips and services to provide safety and peace of mind for your children and their dental health. Fluoride is the best cavity fighter available. It is found in drinking water and most toothpaste. In therapeutic doses, it has been proven to be safe and effective for decades. Fluoride replaces some of the outer enamel calcium ions to make a harder enamel surface which is more resistant to decay. We also recommend "in office" fluoride gel treatments twice a year to give added protection to children's developing teeth. General, we do this until age 18 when the teeth are sufficiently developed. However, in some cases of high decay rates, we will do "in office" fluoride as well as give "at home" prescription fluoride toothpastes. We will advise you if this is necessary in your case. While sports are a great idea for kids, sports injuries are on the rise and can be very serious. We have first hand experience in re-implanting knocked out teeth, splinting loosened teeth and repairing broken teeth. In addition to the obvious tooth injuries, the jaw joint can be permanently injured by an unprotected blow to the jaw. We feel it is mandatory to wear sports mouthguards for every contact sport . While "boil and bite" mouthguards purchased in the store can offer some limited protection, they really don't fit close enough to protect the jaw and teeth from a severe blow and could actually cut into the gums. We can make a professional sports guard that is custom made for your child's mouth at a very reasonable fee. These are the same type of sports mouthguards the professional teams wear, and are made of a soft, shock absorbing material that is very durable. Put only water in a child's bedtime bottle. Wipe an infants gums and teeth with a gauze or damp washcloth - do not use toothpaste. 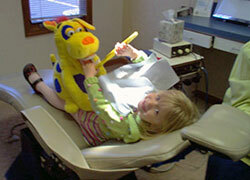 Schedule your child's first dental visit at age three. We will be glad to see them earlier if you suspect a dental problem. Brush and floss your child's teeth until they are old enough to have the dexterity to do this alone. Never use a dab of toothpaste larger than "pea" size on a child's brush. Do not let children eat toothpaste. Avoid sweets as bedtime snacks. Have dental sealants placed on your child's permanent molars.